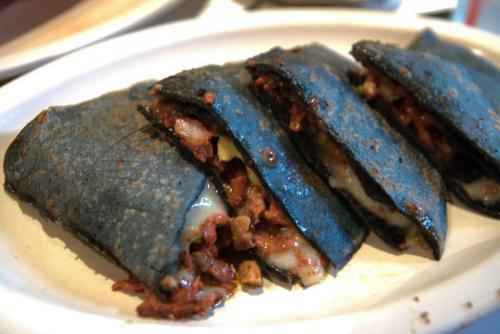 Pumpkin quesadilas with blue corn tortillas make an excellent seasonal snack. If you're looking for a seasonal twist on a familiar favorite, then these zesty pumpkin quesadillas might be just the ticket. Toast walnuts in a skillet over medium heat. Toss until toasted. Set aside. In bowl, stir pumpkin and cumin; season. Spread very thinly over 8 corn tortillas. Sprinkle with cheese and nuts. In large skillet, heat 1 tablespoon of oil to medium. Cook quesadillas one at a time, turning once and adding more oil between batches, until browned, about 3 minutes. Cut into wedges and serve with salsa of choice, chopped cilantro, as desired, and sliced avocado. As a kid, the first tacos I ever had were far from traditional Mexican style tacos. The were much closer to the style of tacos later made famous by chains like Taco Bell and others. They were made with ground beef, lettuce, cheese, and tomatoes. If your kids are partial to the fast food version, they will likely love these little gems. 1 tablespoon vegetable oil ½ cup of water 1½ pounds lean ground beef 2 cups shredded lettuce 2 cups diced tomato 1½ cups shredded cheese ½ cup chopped onion (as desired) 3 tablespoons taco seasoning (see recipe below) 10-12 crispy corn tortilla shells Your favorite hot sauce or salsa, as desired. Heat oil to medium heat in a large skillet. Add onions (if desired) and cook until clear. Add ground beef and cook until brown, draining away any excess oil. Add water and bring to a brief boil, then reduce the heat to a slow simmer. Add taco seasoning to taste. Add more or less as desired. Allow the mixture to cook down for about 10 minutes or so until the water cooks off. Remove from heat and serve meet in crispy corn tortilla shells. Garnish with lettuce, tomato and cheese. Add your favorite hot sauce or salsa as desired. Mix ingredients in a bowl and place in a jar to use as needed. The secret to great enchiladas lies in the sauce. Canned or store-bought saucesusually fall short on flavor and often contain wheat. Many recipes also call for wheat to thicken the sauce. Here's a recipe that will deliver a great, authentic tasting enchilada sauce that will be naturally thick without requiring any flour or thickener. Heat a heavy skillet to medium heat. Tear chillies into flat pieces, tops them, in the pan a few at a time. Use a metal spatula to press them down flat against the hot surface. As they begin to blister and change color, flip them over and press again. Remove the chilies from the heat, and soak soak them in a bowl of hot water for at least an hour, preferably 2 -3 hours. Reserve a cup of the soaking water. Roast the garlic in the pan for about 15 minutes, turning regularly, until almost blackened, and soft inside. Remove from the pan, allow to cool and then peel. Remove the stems from the chiles and puree in a blender with all the other ingredients, except the lime juice and sugar. The sauce will be thick. I like a thicker enchilada sauce, but if you like, you can make the sauce thinner by adding a bit of the water from the soaked chilies, as you like. Add sugar as desired. I also like to add a couple squeezes of fresh lime juice for a bit of extra tartness. You can place any extra sauce in a jar and keep it in the fridge for many weeks. Celiac.com 06/25/2015 - In Mexico and many points south, grilled corn is a staple, delicious snack. In many towns, vendors selling grilled corn are a common sight. This recipe marries grilled corn with mayonnaise, crumbled cheese, lime and a dash of chili powder for a tasty, satisfying snack. Serve it at your next barbecue for sure smiles all around. Put mayonnaise, cilantro and lime wedges into separate bowls. Crumble the Cotija cheese on a plate and set aside. Mix crumbled bacon into the butter and set aside. Remove corn husks, and brush each corn cob with olive oil and a dash of pepper. Wrap each ear in aluminum foil. Grill each side for about 20-25 minutes total, turning corn every 5 minutes or so to make sure the whole cob is properly cooked. Once corn is finished, pull it off the grill, and set aside to cool for about 5 minutes. Lightly brush each cob with the bacon butter, or mayonnaise, as desired. Dust lightly with salt, and chili powder, as desired. Then roll each cob as desired in Cotija. Top with fresh cilantro and serve with lime wedges. Celiac.com 12/23/2015 - Got some ribeye? Some provolone? Good, grab the ribeye and the cheese, along with some onions, green peppers, and corn tortillas. Tortillas? Yeah, tortillas. This simple variation turns the traditional Philly Cheesesteak into a quesadilla. It makes a great holiday snack, or as an anchor for your favorite football games. Will it be like on original Philly Cheesesteak? No! It will be a gluten-free version with a Mexican twist that you make at home. But it will put a smile on your face. Heat a large fry pan over medium-high heat. Add the onions and bell pepper and cook, stirring, about 6 to 8 minutes, until caramelized. Then, push the veggie mixture off to one side of the pan. Add the meat to the hot part of the pan. Cook, continuously flipping the meat over and slightly chopping the meat into slightly smaller pieces with 2 spatulas, until the meat is no longer pink, about 2 minutes. Divide into two portions, and top both portions with the cheese to melt. In the last minute or so, toss the corn tortillas on the grill until they start to soften. Grill both sides, then top with the meat and cheese mixture. Top with a final grilled tortilla. Flip again and cook a few seconds before removing. Serve hot. Don't dig quesadillas? Grab some of your favorite gluten-free bread and go traditional, or cook up some french fries and top them with the cease steak mix. You really can't go wrong.